It’s a fine movie, very PBS-y and Masterpiece-y and period-y. 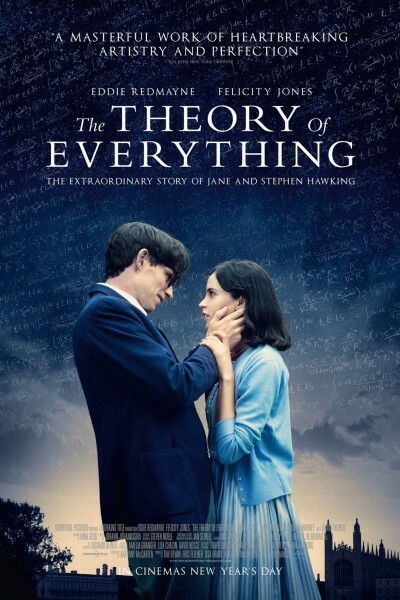 But gosh, Stephen Hawking’s spacy and abstract assertions, personal and vocational alike, are themselves such philosophically conceptual black holes that I left feeling like I’d seen a great costume drama, with phenomenal acting and lots of depressing nothingness. It’s very hard to care about a romance once knows ends in divorce, but certainly inspirational to learn more about a man who has done all he has, day after day after day, for decades on end and to worldwide acclaim. Kudos to Dr. Hawking for that, absolutely, and for Eddie Redmayne’s and Felicity Jones’s performances. He was amazing in Les Mis, is amazing here, again, and she is captivating and steadfast.